Hanny's Voorwerp, a cloud of gas, is glowing due to radiation from the giant black hole at the center of the galaxy IC 2497. Astronomers think the giant black hole in IC 2497 used to power a quasar in the past, but has faded in the last 200,000 years. Chandra data suggests that jets powered by the black hole have blown a bubble in surrounding gas. By observing both of these objects, astronomers can probe the history of IC 2497's black hole and its effect on its host galaxy. Two cosmic structures show evidence for a remarkable change in behavior of a supermassive black hole in a distant galaxy. Using data from NASA’s Chandra X-ray Observatory and other telescopes, astronomers are piecing together clues from a cosmic “blob” and a gas bubble that could be a new way to probe the past activity of a giant black hole and its effect on its host galaxy. The Green Blob, a renowned cosmic structure also called “Hanny’s Voorwerp” (which means “Hanny’s object” in Dutch), is located about 680 million light years from Earth. This object was discovered in 2007 by Hanny van Arkel, at the time a school teacher, as part of the citizen science project called Galaxy Zoo. Astronomers think that a blast of ultraviolet and X-radiation produced by a supermassive black hole at the center of the galaxy IC 2497 (only 200,000 light years away) excited the oxygen atoms in a gas cloud, giving the Green Blob its emerald glow. At present the black hole is growing slowly and not producing nearly enough radiation to cause such a glow. If the black hole was growing at a much higher rate in the past and then slowed down dramatically in the past 200,000 years, the glow of the Green Blob could be consistent with the present low activity of the black hole. In this scenario, the blob would become much dimmer in the distant future, as reduced ultraviolet and X-radiation levels from the faded quasar finally reach the cloud. In this new composite image of IC 2497 (top object) and the Green Blob (bottom), X-rays from Chandra are purple and optical data from the Hubble Space Telescope are red, green, and blue. New observations with Chandra show that the black hole is still producing large amounts of energy even though it is no longer generating intense radiation as a quasar. The evidence for this change in the black hole’s activity comes from hot gas in the center of IC 2497 detected in a long exposure by Chandra. The center of the X-ray emission shows cooler gas, which astronomers interpret as a large bubble in the gas. Astronomers suspect this bubble may have been created when a pair of jets from the black hole blew away the hot gas. In this scenario, the energy produced by the supermassive black hole has changed from that of a quasar, when energy is radiated in a broad beam, to more concentrated output in the form of collimated jets of particles and consistent with the observed radio emission in this source. Such changes in behavior from strong radiation to strong outflow are seen in stellar-mass black holes that weigh about ten times that of the Sun, taking place over only a few weeks. The much higher mass of the black hole in IC 2497 results in much slower changes over many thousands of years. 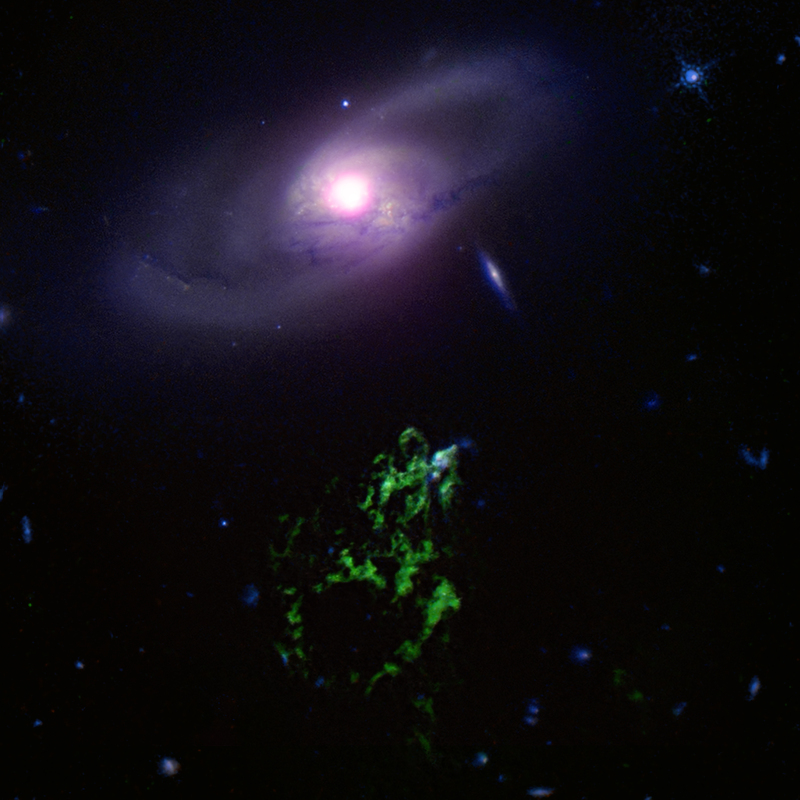 The citizen and professional scientists of the Galaxy Zoo project have continued to hunt for objects like the Green Blob. Many smaller versions of the Green Blob have been found (dubbed “Voorwerpjes” or “little objects” in Dutch.) These latest results from Chandra suggest that fading quasars identified as Voorwerpjes are good places to search for examples of supermassive black holes affecting their surroundings. A paper on these results recently appeared in Monthly Notices of the Royal Astronomical Society and is available online [http://arxiv.org/abs/1601.07550]. The authors of the paper are Lia Sartori (ETH Zurich), Kevin Schawinski (ETH Zurich), Michael Koss (ETH Zurich), Ezequiel Treister (University of Concepcion, Chile), Peter Maksym (Harvard-Smithsonian Center for Astrophysics), William Keel (University of Alabama, Tuscaloosa), C. Megan Urry (Yale University), Chris Lintott (Oxford University), and O. Ivy Wong (University of Western Australia). Coordinates (J2000) RA 09h 41m 04.10s | Dec +34° 43’ 57.70"
Observation Time 42 hours 18 min (1 day 18 hours 18 min). A galaxy and a cloud of cool gas located about 680 million light years from Earth. X-rays are purple, optical red, green and blue.